Allstar Allister and Pulsar garage door opener replacement repair parts for models Access 200, 250, ARD-II A, Access 2000 2500, 3000 3500, PDQ, Allister Century Series 310, 510, 710, Sprint and 325B. *******This part is located on the front of the rail assembly above the garage door. The old sprocket has been replaced with this pulley. For Allstar, Allister, Pulsar and MVP garage door openers. Compatible with models ARD-II A, Access 200/250, Access 2000/2500, Access 3000/3500, PDQ, Allister Century Series 310/510/710 garage door openers. This part is located on the front of the rail assembly above the garage door. *******This part is located on the top of the main power head. This part WILL NOT work on the front of the rail assembly. This part is located on the top of the main power head. Compatible with models ARD-II A, Access 200/250, Access 2000/2500, Access 3000/3500 (openers built prior to 09/93), Allister Century Series 310/510/710 garage door openers. For Allister 6000, 6500, PDQ garage door openers. For Allister MVP, ARD-IIA, 2000, 2500, 3000, 3500 garage door openers. For Allister PDQ, 3000, 3500, 6000, 6500, MVP series garage door openers. For Allister ARD-II A, Access 2000/2500 garage door openers. For Allister ARD-II A, Access 200/250, Access 2000/2500 Access 3000/3500 garage door openers. Includes: 1-PM067 spring cage. 1-PX053 sensing spring. 1-P100198 sensing screw. 1-CF120 sensing nut. Parts sold as a kit - NOT available separately. For Allister, Allstar, MVP garage door openers 53/64 MFD. Older Allister part number E017 & E021. For Allister, Allstar, MVP garage door openers 67/76 MFD. For Allister, Allstar, MVP garage door openers 43/53 MFD. For Allister garage door opener models ARD-IIA (NOT compatible with ARD II), Access 2000/2500, Access 3000/3500, 6000, 6500, PDQ, and MVP series. Includes drive shaft with sprocket (older part number PH060 or 108346), bushings, idler sprocket, and chain guard (older part number 104470). For Allister garage door openers ARD-IIA, Access 200/250, Access 2000/2500, Access 3000/3500, PDQ and MVP Series. Compatible with PDQ series garage door openers. Compatible with models ARD-II A, Access 200/250, Access 2000/2500, Access 3000/3500 (openers built prior to 09/93), Allister Century Series 310/510/710 and MVP garage door openers. Static free. Diameter approximately 9"
If needed, remove linkage and chain from old trolley when replacing. Comes with about 18" of wire for splicing into existing wiring. Compatible with all models currently using safety sensors. Compatible with Challenger models 1500, 9100, 9300, 9500, MVP. Sprint, 310/510/710, 200/250, 325B Type III. 2000 series, 3000 series, 6000 series. 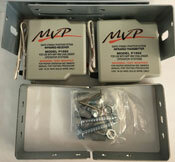 Compatible with all MVP series garage door openers.